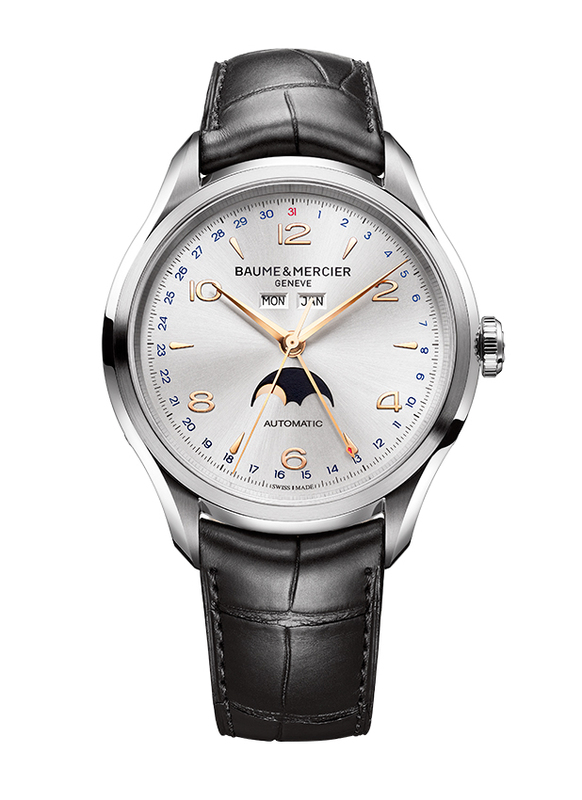 Baume & Mercier Clifton Complete Calendar -Moon phase, silver-colored dial (Ref 10055): Unveiled at SIHH 2013, this watch from the Clifton collection, the archetype of urban timepieces from the 1950’s, is here revisited with a case in polished satin-finished steel, but with a more modern diameter of 43 mm. In addition to the time displayed on this version’s dial, it displays the date, the day and the month, as well as the moon phases contained within a large aperture located at 6 o’clock. Powered by a Swiss-made mechanical self-winding caliber (Dubois Dépraz 9000), visible from the sapphire-crystal case-back, this resolutely urban timepiece has been finished with expert attention to detail. It is mounted upon a black alligator strap and closed by a triple folding clasp, with security push-pieces. 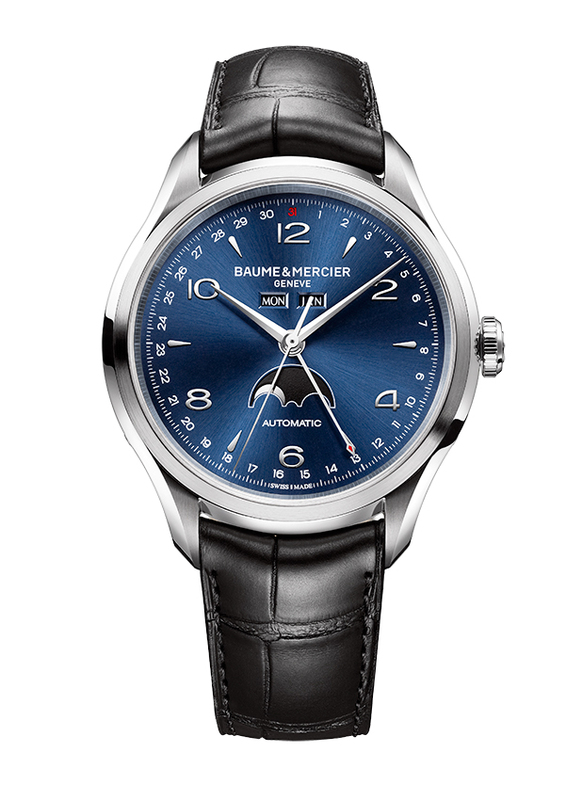 Clifton Complete Calendar – Moon phase,blue dial (Ref 10057): With such visual impact, this version of the Clifton Complete Calendar commands attention thanks to its blue,sun satin-finished dial. As with every connoisseur timepiece, the case back of the 43 mm case, water-resistant to 5 ATM, has been opened up to allow lovers of fine mechanics to observe the components of its automatic movement (Dubois Dépraz 9000). With such graphic potency and its essential calendar display, this complication version is mounted upon an alligator strap, which is closed by a triple folding clasp with security push-pieces.